Leather Cosmetic Bag - Leather Makeup bag, Leather travel pouch or leather purse. 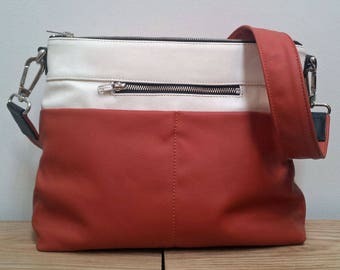 Cowhide Leather purse with flap, tan and cream, for coins, cardholder, lipstick and make up purse. Bronze leather purse - metallic finished leather. These cowhide leopard print purses are exactly what I was looking for! Attractive and sensual, they appear to be well-constructed. I feel it is a good value for the price. The quality of the product and the service from the vendor ... both were exemplary. I am a happy customer! This is the best dopp kit I've ever owned. 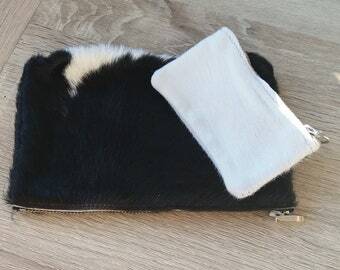 It is at least two ply material and large enough to keep all my toiletries. If you like no frills high quality travel preparation this is for you. Each item we make begins with our locally sourced cowhides, oilskin waxed cotton, and the leather that we will use. Each cowhide is hand-cut into a unique pattern that we take a lot of time over to ensure what we cut will make a perfect finished product. The most exciting aspect of what we do is seeing natural, raw materials become something, useful, beautiful and cherished. All our bags and accessories are made in New Zealand and we are dedicated to producing unique designs, quality workmanship and using beautiful leather. It is our aim to provide you with beautiful origin(al) pieces that will provide you with enjoyment for many years. A winding road has led my creative side here as both owner and designer of Anoa Design Ltd and the Florian Rhodes brand. Interior design and a passion for textiles and history, followed by 8 years living as an expatriate in Asia, a young family and finally returning to New Zealand. Travel and life abroad ignited a desire to know the origin of the products I loved, who and how they were made; for great travel accessories that were well designed and made to last; and a passion for pieces made from natural materials. All these desires are found in the products here in my store. The origin of many of our designs is a 50 year old archive of patterns hardware and embellishment's that were part of the original Florian business. 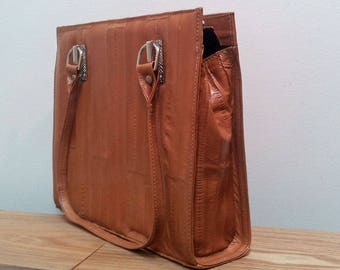 They serve as continual inspiration along with my collection of vintage Florian leather bags. We will be opening our new Vintage shop section shortly. We understand it is a risk buying items online, so if you are not completely satisfied with your purchase, we will happily provide you with a full refund, provided the item is returned to us within 14 days, in original condition/ packaging and with tags. If the goods are returned after the 14 days have passed it will be at the owners discretion as to whether a refund will be given. For customers returning items from overseas please contact us with the return information within the 14 days so we can speed up the processing of your refund. If your purchase arrives damaged or it is not what you ordered, please email or call us as soon as possible so we can set things right with either a refund or a replacement. PAYMENT: We accept online payments through our Etsy Shop payment channels only. CANCELLATIONS: We will accept cancellations for orders (including custom orders) within 24 hours of the order being placed. Full refunds will given for cancelled orders made within this time period. It will be at our sole discretion as to whether we can accept a cancellation requested after 24 hours. New Zealand orders are shipped with Toll Couriers who have a targeted delivery time of 3-5 days throughout New Zealand or with New Zealand Post who have a target delivery of 4-6 days. In Stock: For items designated in stock, your order will be processed within three business days (excluding delivery time). You will receive an email to let you know when your order has been sent. Made to Order: Your order will be created by our team over 15 working days (excluding delivery time). We will send an email to let you know your order has been sent. For International Customers: Packages will be sent via New Zealand Post International Non Tracked Airmail with a targeted delivery of 10- 14 working days. We are happy to quote for Tracked Airmail if this is your preference. Please be aware you may still have to pay international customs charges, duties or taxes in your country in addition to the cost of postage. Please be aware we have experienced some delay's with packages being slow to pass through customs in European Continent Countries. CUSTOM ORDERS: We are happy to accept custom orders. Please contact us with your requirements. If you are interested in purchasing our products wholesale please visit our company website www.anoa.co.nz for information or email michelle [!at] anoa.co.nz.